'Pullman Porter Blues' Travels Back In Time NPR's Michel Martin speaks with actor Larry Marshall and playwright Cheryl West about Pullman Porter Blues, a play that tells the story of three generations of African-American railway porters in 1937. Left to right: Actors Cleavant Derricks (as Sylvester), Warner Miller (as Cephas) and Larry Marshall (as Monroe) star in Pullman Porter Blues. Today, people board jets or hybrid minivans to travel cross-country. But from the late 19th to mid-20th century, people traveled by train. And that's where they met the legendary Pullman porters. The Pullman porters were primarily African-American men who collected luggage, served drinks, made beds, polished shoes, tended to the sick, comforted crying babies and even entertained guests. It was viewed as a prestigious job — a far cry from working the fields — but it was also grueling work. Despite being on their feet for hours on end, Pullman porters were required to keep a smile on their face and show pride in their work. Playwright Cheryl West brings their story back to life in a new play, Pullman Porter Blues, running at Washington, D.C.'s Arena Stage through Jan. 6. West was inspired by her grandfather, who worked on postal trains, and a trip she took as a young child. She remembers the porters' smiles and their impeccably pressed white jackets. 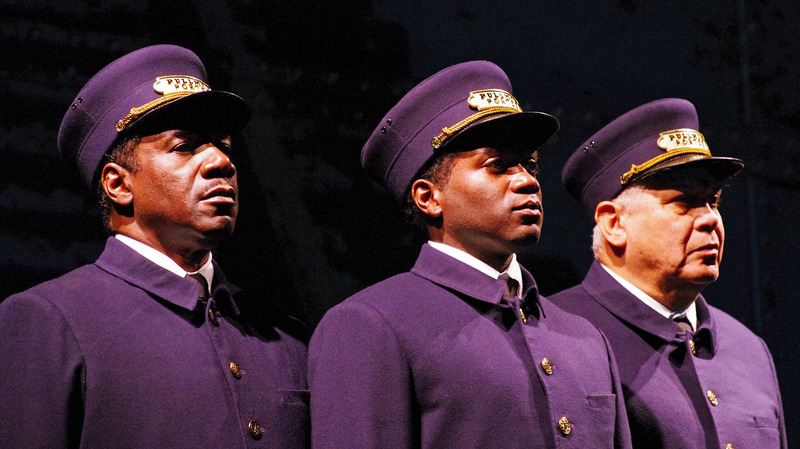 The play depicts the lives of three generations of Pullman porters in 1937. On an overnight train from Chicago to New Orleans, they bond — and squabble — over their past and their dreams. Grandfather Monroe (Larry Marshall) is prideful about his work; his grandson, Cephas (Warner Miller), is idealistic and wants to travel the country. But Sylvester (Cleavant Derricks), Cephas' father, is tired of answering to the white man's demands and wants his son to become a doctor. The life of a Pullman porter was difficult, says actor Larry Marshall. "If anything was missing, you had to pay for it," he says. West takes pains to show the downside of the porters' jobs — positions that many African-Americans envied. "Sometimes those men were on their feet 24 hours and did not get to rest, did not get to sleep," West tells NPR's Michel Martin. "And the other thing was, they ... would take two to three hours to get the train ready, and they would not be paid for that time at all." 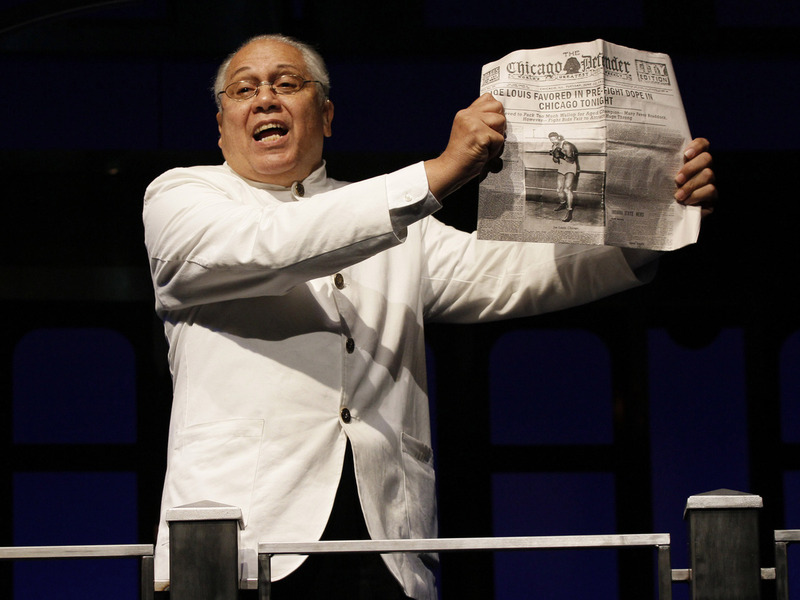 The play incorporates blues songs like "Trouble in Mind" to express difficulties the porters couldn't easily talk about. "If anything was missing, you had to pay for it," actor Larry Marshall tells NPR. "If a passenger stole an ashtray, they counted everything in your car, in your area where you were responsible. If anything was missing, it came out of your check." Industrialist George Pullman created the luxury railroad cars that bore his name in the late 19th century. He hired former slaves as porters just a few years after the Emancipation Proclamation was signed. But systematic racism made their work lives burdensome. West recounts stories of porters being awakened just to sing or dance for white passengers. Civil rights leader A. Philip Randolph advocated for better working conditions for the Pullman men. He helped organize the Brotherhood of Sleeping Car Porters, the country's first black labor union. After years of fighting, the Pullman Company eventually agreed to higher pay and shorter hours for porters. Randolph's fight for better working conditions for African-Americans extended to equal rights in other areas, too. He joined Martin Luther King Jr. at the 1963 March on Washington. Historians often credit that event with giving rise to the Civil Rights Act of 1964.